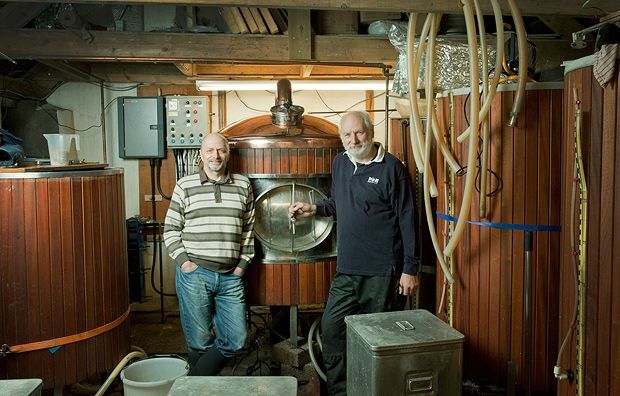 The story goes that a chance remark in a pub prompted Jim Hughan and Ross Niven to start MòR Brewing, a Dundee-based microbrewery making a range of real ales. The brewery now supplies beer to a dozen bars along the coast from Dundee to Arbroath. The name is Gaelic for 'big', although the scale of the operation is still fairly micro. The range consists of a hoppy session bitter called MòR Tea, Vicar?, a malty amber ale (MòR-ish), a stronger session ale (MòR Please) and a fruity premium ale called MòR the Merrier. Listed in the Angus Larder and the Dundee Larder – order print copies (free + p&p). The story goes that a chance remark in a pub prompted Jim Hughan and Ross Niven to start MòR Brewing, a Dundee-based microbrewery making a range of real ales. The brewery now supplies beer to a dozen bars along the coast from Dundee to Arbroath. The name is Gaelic for 'big', although the scale of the operation is still fairly micro. The range consists of three regular beers – a hoppy session bitter called MòR Tea, Vicar?, a malty amber ale (MòR-ish) and a stronger session ale (MòR Please). In addition they periodically brew a full-bodied stout called MòRTicia and a spicy number they call MòR Calm & Wise. At the turn of the century Angus hadn't seen an operational brewery for 50 years. These days, as part of a wave of craft brewing across the UK, the region has half a dozen engaged, enthusiastic brewers who are quickly establishing a local following. 'I don't watch a lot of telly, put it that way,' says Colin McIlraith, who spends much of his spare time in his garden shed instead. That might not seem an unusual way to while away an hour or two, but not many sheds can boast their own micro-brewery. When Alan Lawson established Angus Ales in 2009, there had been no brewery in the county of Angus for half a century, he says. The new micro-brewery found plenty of inspiration in the area's championship golf courses. Looking for events in Kellas?